With the exception of a few evergreens that I acquired from a friend, I have built all of these trees from basic materials: wire, flexible modelling paste, poly-fiber and leaf material. I don’t do this because I’m trying to save money on trees, although I just did the calculation and each home-made tree cost me less than $2.50 to create so there’s certainly an argument for doing it oneself. And I certainly don’t do it to save time because each tree takes one to three hours (spread over three or four days because there’s a lot of drying time involved in crafting the armatures). Rather, it’s a matter of personal preference. I’m fussy about trees. I appreciate that to be cost effective, commercial offerings need to be mass produced. But I’m underwhelmed by most commercial trees – not only the ready to plant ones, but also the kits. So to get the trees I want, I have to build them myself. What do I want? For starters, I feel that each tree has to be custom-crafted to fit the space. What height does it have to be? What shape? Is it in the middle of a forest, or at the edge? Is it near water, or a field, or other open space where it can grow sideways as well as up to catch more sunlight? And does it have a practical role to play on the layout, such as hiding a non-prototypical tunnel or the spot where a river hits the backdrop? – For those who are not in the hobby, or who know nothing about CNR steam locomotives, the most they could say with certainty is, “Yes – those are steam locomotives”. – For those who know something about CNR steam locomotives, the most they could say with certainty is, “Yes – those are CNR steam locomotives”. – Only those few who know a lot about CNR steam locomotives could say with certainty, “Yes – that’s a CNR 2-6-0”. – Even fewer still could say “Yes – that’s how CNR 80 looked in the era that’s being modelled”. By contrast, everyone who sees my layout knows what a tree looks like. – An arborist or avid gardener might look at my trees the way a CNR steam expert looks at my locomotives. And they would probably find fault with my trees, which – I’ll freely admit – tend to be generic. There are many people in this hobby who will argue that convincing trees aren’t worth spending the time on. I’ll only say that’s a personal decision – and let my tree models argue in my favour. There are lots of articles telling us how to cover scale acres of landscape with forest using techniques billed as “fast” or “easy” – or both. Again, whether one is satisfied with the results is a personal decision. But for me, trees are a no-compromise item. A convincing tree is worth the time invested. However, they do take time. As I noted, I’ve built almost 50 trees for the Lynn Valley area of my layout. That means I’ve invested 50 to 150 hours to build these trees – and yet I’m only half done. Then there are the other areas of the layout, which will probably require another 50 trees – at least, because as every layout builder who has planted trees knows, it requires an astonishing number of them to make a forest. Not everybody pursues craftsmanship in this hobby. But I try to – and one of the advantages of designing and building an achievable layout is that it has allowed me to invest the time required to build the things I need done right. 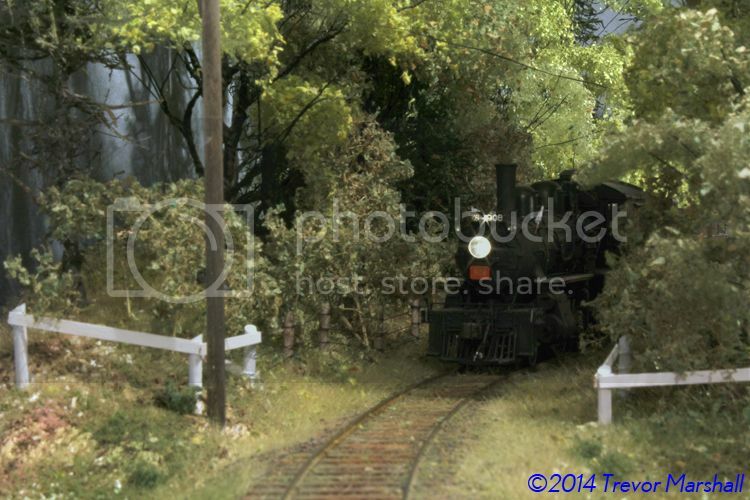 For me, that includes building convincing trees to frame the scenes through which my trains run. Along the way, I’ve learned a new technique that has added to my satisfaction with the hobby – a technique I would probably have rejected out of hand as “too time consuming” had I been trying to build a huge layout. This entry was posted in Philosophy by Trevor. Bookmark the permalink. Hi, Trevor. I enjoyed reading so many parts of this post and all of the sentiments. I wonder if making trees should be a good project to introduce modellers who perhaps haven’t had a chance to get involved in making models to try? By and large I feel like it’s one of those regions in the hobby where really terrific models are still being produced from humble and relatively commonly available materials and using basic tools. Since, by their nature, there’s some room to be a little imprecise with critical dimensions, compared to a structure model, it might aleviate some of the rigour associated with more typical model making projects. These same great models are the product of careful observation and patient work and their success is bound to that and not really affected by how much money you spent at the hobby shop or how “new” the model is. I thought you touched on a really important point when addressing how scenery items are really the common ground that invite folks who aren’t into the hobby into our model railways. Everyone knows trees, for example, and everyone probably enjoys looking at a well done model of one. I think it’s something that everyone can appreciate. 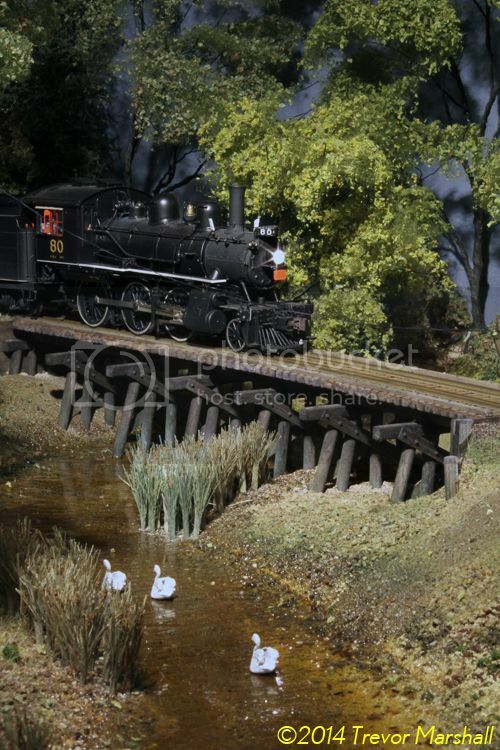 Often when introducing our model railways we get right into the trains and perhaps taking care of the scene provides us with a chance to introduce the work first by situating it in that landscape. This way, in every viewer’s eyes we have a train in a landscape in model as in “real life”. Great thought – thanks for adding it to the conversation. I agree, completely, that presenting trains in context – with a high standard of modelling throughout – is essential to convincing non-hobbyists that our hobby is about so much more than Big Kids Playing With Toys. Changing the conversation from “This is easy and fun” to “This is challenging yet rewarding” is the only way for the hobby to be taken seriously as an adult pursuit. Showing what can be done – by replicating reality in miniature – impresses the socks of everyone, regardless of whether they’re already model railway enthusiasts. And it demonstrates – without reservation – why our hobby is a worthwhile pursuit. Starting with trees, rivers and other scenic features – or, at least, fostering the mindset that they should be paid as much attention when creating them as we pay to the trains – would certainly help.